Reaching that ideal weight is accomplished by millions of people each day. Maintaining that ideal weight, however is a much greater task. 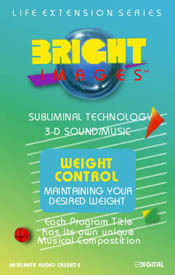 Once you have reached your goal, this program subconsciously creates the images and concepts necessary for lasting weight control. In addition to reaffirming all of the positive foundations set forth in the weight loss program, it maintains consistency in your ability to keep yourself healthy. You will enjoy a happy life through regular exercising and daily eating habits of nutritional foods that keep you healthy and trim.